Do you believe in magic? After seeing FISM world champion Rick Merrill turning a yellow pencil into a red one in the twinkling of an eye, you will. Last night, the magician and comedian performed his signature coin and pencil tricks before hundreds of journalists in Beijing. He was here to promote the FISM 2009 World Championships of Magic in July, and the World's Greatest Magic Show in August. 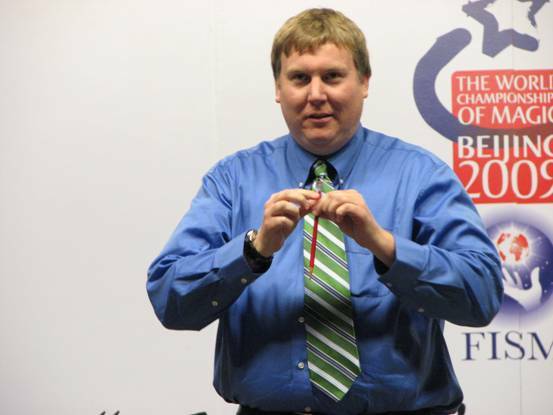 Rick Merrill, FISM world champion, performs his signature pencil trick. You might not have heard of the FISM World Championships of Magic, but among magicians, they are legendary, holding a position as supreme as Hogwarts in the Harry Potter world. The championships are held by FISM (the International Federation of Magic Societies). Only professional magicians can register to attend the event, and only those who win can be recognized as the world's greatest magicians by the Magic Circle. The event is held every three years in different cities around the world. This year, it will kick off in Beijing on July 26. If you have no magic talent to get you into the championship, don't worry. You will still have the chance to see the world's most stunning magic. From August 1 to 8, a line-up of FISM world champions and the world's most renowned magicians will give their most spectacular performances at the Beijing Exhibition Center. There will be tricks and illusions with coins, banknotes, cards, fish, and even crocodiles. In 20 minutes, some 50 articles will pop out of thin air or disappear before your eyes. Around ten top magicians will present the audience such awesome feats as flying in the air. 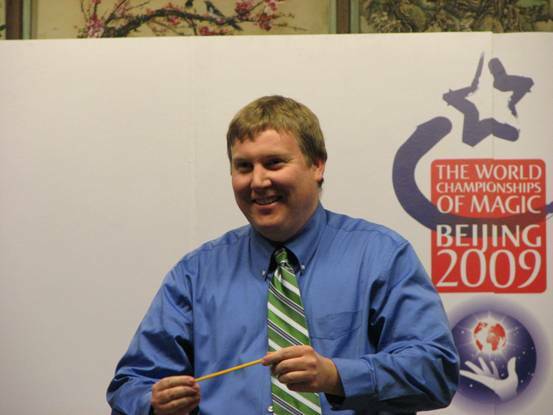 Rick Merrill, FISM world champion, performs his signature pencil trick. Before an audience of hundreds, he turns the yellow pencil into a red one in the twinkling of an eye.